This year, I decided to spend some extra time with procedural text. How-to texts, directions, instructions, whatever you want to call them--these are going to be the backbone of students' future reading lives. Not all of my students will pick up novels to read for pleasure when they are adults. But they will all need to read and understand directions in one form or another. So, for the past week, my students have been immersed in how-to text. I've gone to tic-tac-toe choice menus for reading homework, and one of the favorite activities was to make a recipe with a parent and bring in the recipe to share. (Not the food, I emphasized to the students. The recipe!) We've looked at their similarities and differences, and students shared their experiences. I'm trying to be more conscious about bridging home reading and school reading, and I wanted students to recognize the wealth of reading opportunities they had at home. We heard some beautiful stories of parents taking the time to put treasured recipes on paper--and other stories of students who reminded their parents of the need to follow the recipe! We also tried to follow directions together--with mixed results. Let me just say that origami is not my strong suit. I found these directions and printed them out for students to try. I wanted to draw students' attention to the features of how-to text: a list of materials, pictures, steps. Then, I thought, we could all have beautiful snowflakes to share. Because I wanted students to try their hand at narrative directions, we also read a text about how to make a lay-up, and then went to the gym to try it out. I knew that the students would have more trouble with the narrative directions, directions that were organized as a paragraph instead of a numbered list. I was right! They didn't read these directions as closely as they should. But what makes a better life lesson? Not reading the directions well and answering some questions wrong, or not reading the directions well and failing to complete the task? Well, judging from the expressions of my students, they learned more from realizing that they needed to read the lay-up directions with more care. Tomorrow, they'll have the chance to translate the narrative directions into steps and try again. They are excited to be working with how-to text...and I am excited to see their learning! Last year, our state science tests fell before our science teacher was able to teach her Light unit. She was worried that students would not know the words transparent, translucent, and opaque. I saw the opportunity to use this concept in reading class as a way to reinforce summarizing and teach students how to learn from nonfiction text. Because I couldn't find any texts that suited my purposes, I wrote a short article to explain the concept. After we read it, students sorted ideas from the text as important or less important, and then used that sort to write a summary. It worked well! I decided to post it to help out those who are constantly scrounging for easy science text. Essays are mostly finished! Several committed (and detail-oriented) students are putting together the fish pictures and essays so that we can publish our book to share. The entire project took quite a while, even longer because we did all of the work in class. That's right, no writing homework. I've found that many of my students really need my constant support and intervention in order to create a quality product. I learned this the hard way. I'd tell students, "Your final draft is due tomorrow!" And many of them would dutifully bring back their final draft. Unfortunately, the drafts would be riddled with errors. And I am so soft-hearted that I had a really hard time telling students that they had to start over. Even worse, some students would lose their rough drafts, or never turn in a final draft at all. I loathed having to track down students. Now, I have a different approach. I know that some students will want to do their final drafts at home, and this is fine. Some parents enjoy this opportunity to sit down at the computer with their child and work on a product. But all students have the option of working on their final drafts in class. This does present some management issues, as students finish at different times. However, thanks to the time that I spent developing journal writing at the start of the year, students are happy to settle back into their self-directed writing. Students have re-discovered stories, drafted holiday cards for friends and family, and even started writing plays. Students also had the opportunity to compare and contrast their fish and another student's. Even though everyone is working on different projects, writing is progressing nicely. As students worked to finish final drafts, the classroom settled into a quiet, productive hum. Now that we have moved on to sentences, all but three of my 60 students have finished their essays. No homework, no lost papers, no tears, no parent phone calls. Pretty good! December is a great time for focusing on sentences...they're short! I like to squeeze in some lessons about sentence variety in between the Santa's Workshop, choral concerts, sing alongs, and other holiday cheer. When I teach about sentence variety, I start out by helping students to understand what the word variety means. A very tangible way to do this is to bring in a variety of something...whether it is a variety of candy, a variety of fruit, or a variety of toys, being able to experience variety helps students to understand why it is something they might want to use in their writing. Once students understand what variety means, we look at how to add sentence variety to their writing. The best way that I have found to do this is to have students go back through their journals and find a piece that they have written. Then, they count the number of words in sentences and make a list of the first word in each sentence. I model how to use this information as a starting point for revising for sentence variety. What can we do if we find out that all of the sentences have the same number of words? How can we revise to use different sentence beginnings? Students pick up on these ideas pretty quickly. Even struggling writers can notice that all of their sentences begin with the same words, and can find some ways to make improvements. For the weeks approaching the holiday break, this is about all that I can ask for! I used to think that teaching writing was all about the big, important questions--how does a writer share an experience? Which details are most important? What brings a piece of writing to life? But now I know that there are tedious, mundane questions that must be answered as well. Which is what led me to teach a lesson about notebook paper. Why notebook paper? Well, there is not enough time before the holidays for every student to type their essays, so students are writing out their final drafts by hand. As they create final drafts, they need to understand how to use notebook paper. When I first started teaching, I didn't really care much about how students created their final drafts. I didn't want to be as tyrannical as the teachers I had had growing up, who would get out the ruler to make sure that my title was precisely centered. But when I didn't take the time to build expectations for final drafts, I received--well, very interesting papers. Final drafts on the backs of notebook paper, pages with titles scrawled across the top, pages with food spots on them. This made the task of grading (which I hate anyway) even more depressing. Now I realize that it is important for students to care about how their final drafts look. And I need to teach it! So we spent class time this week examining a piece of notebook paper. Where do the holes go? (My students don't use binders, so putting the holes on the left does not seem like a big deal to them.) What do those pink lines mean? Where should a title go? What do we do if we make a mistake? "This is boring," one student sighed. I have to agree. At the time of the final draft, all of the possibilities of the writing task have been narrowed into one and only one product. Whether you are typing or writing by hand, creating a final draft is tedious. It doesn't have the fresh sparkle or amazing possibilities of the composing process. Making a final draft to share requires intense focus and discipline. "Mrs. Kissner?" a student whispered at my elbow. "Can you help me? I don't think I really know what indenting means." Well, this week we're in the final days of finishing our essays. These are always the messiest times, with students scattered all through the stages of the writing process. 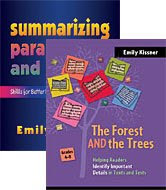 I'm helping students edit, work through their revisions, getting a few set up on our classroom computers, and helping students get started with final drafts. This is when I need writing coaches. Every class has a few students with an intuitive feel for the writing process, a few students who can pull great writing out of their peers. I call on these students when I feel stretched, and they never disappoint. In one class, one student helped a girl who had been absent for several days, coaching her through the revising checklist. In another class, a boy helped a student to add details to a body paragraph that was a little thin. The entire process works more smoothly if there is a specific outcome. "Help Alicia with her piece" is not nearly as effective as, "Alicia is having trouble with an introduction--could you show yours to her, and help her to create one?" After a few minutes, both students are proud of what they have accomplished. And, today, there were two students that were just as frustrated with me as I was with them. For some reason, the lessons hadn't clicked, and their rough drafts were muddled. I had worked with each individually, but they seemed sullen and resistant. Enter the writing coach! Sometimes another student can explain things in a way that makes sense to struggling students. Writing coaches are not necessarily the best writers in a class. But they are always the students who ask questions. Writing coaches are honestly interested in writing, and really care about what their peers have to say. Having students who are able to help one another makes the writing classroom a better place. How do we get kids to revise? This is often a matter of great frustration for teachers. Instead of really jumping back into a text, many students just halfheartedly circle a misspelled word here and there. As I started revising this week, I decided to add some glamor. I handed out "Magic Microphones" to the students. Really just rolled up pieces of paper, these microphones were supposed to make reading their pieces aloud more engaging for students. (Yeah, the special educator who co-teaches with me for the first class thought it was a ludicrous idea as well!) Why? As I've watched my students, I have noticed that they make more changes when they read their text aloud than when they just look at it silently. After the Magic Microphones, I introduced the Revising Checklist. My revising checklist was very specific, directing students to look for an introduction, a topic sentence for each paragraph, and a conclusion. Then, students had to find one place to ADD a detail and one place to CHANGE something. These very explicit words make the nebulous idea of "revising" more concrete. Was it perfect revising, all over the room? No, of course not! But I saw progress. I saw lots of Post-Its being passed around. I realized that a small group of students in each class were still not entirely sure of what a topic sentence is. And I noticed many students going back to our example essays--and even Surprising Sharks--to find out what an introduction and conclusion should be like. Students are still working on their fish essays. As they move from graphic organizer to rough draft, I've found that it's very helpful to give them a rough draft template. I first created this back when I taught sixth grade. I was horrified to see that students were writing each paragraph on a separate sheet of paper! Somewhere along the line, they had started to see each part of the essay as a separate piece of writing. The rough draft template helps students to see what their writing will look like in the end. I used text boxes to remind them of the job of each paragraph. This template also frees students to use some of my favorite writing tricks, like skipping the introduction at first. (I do so hate writing introductions!) They can easily see where the introduction should go, leave it blank, and jump right into Body Paragraph #1. Like any scaffolding tool, I use this one just at the very beginning. By the end of the year, many students have enough of an understanding of structure that they can create essays without this support. I have gone back and forth on the merits of five paragraph essay. My current thinking is that if I teach it to students in fourth grade, then by middle school they'll be past its constraints and be ready to soar with new, more complex forms. That's my hope, at least!